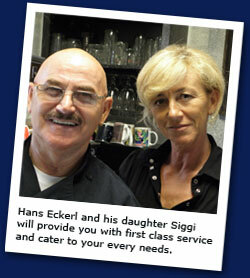 Hans Eckerl, chef and owner of Bistro Munich and daughter Siggi love to welcome YOU to wonderful Lehigh Acres Florida! Bistro Munich on the 2nd floor of the VILLAGE-AT-LEHIGH building, offers romantic dining experience inside with A/C or on the outside patio. TV’s inside and outside provide international news and information. Bistro Munich style entertainment and dining experience. Bistro Munich—meet local celebrities and international stars. You never know who will be dining at the Bistro Munich next. what’s new at the Bistro Munich!